The cost of manufacturing renewable technology such as PV is reducing quite rapidly as the volumes increase and the technology is refined. Also the cost of existing electricity production (eg oil and coal) continues to increase as these resources become scarcer and the very real cost of pollution is taken into account. At some point the cost of PV electricity will be the same as existing polluting energy sources and that is called “grid parity”. It is not certain when PV grid parity will happen in the UK but some countries, where larger investments in PV have already been made or energy prices are higher, this is close or even achieved. It is likely the UK will achieve a grid parity cost from PV by 2020 at the latest. What is clear is that the more PV is installed in the UK the sooner grid parity will happen and the less the UK will pollute. Recently Scottish Power announced a big rise in energy prices, with other companies likely to do the same (read the BBC story here). 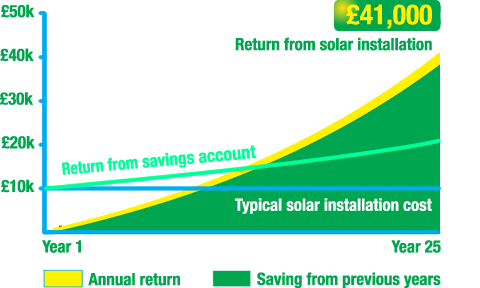 The graph below shows the return on investment from a typical installation of solar power, assuming prices rise at 6% per year. Many people believe this figure will be substantially higher.